Self Publishers – Build Awareness, Increase Sales. A special opportunity for self-published authors to learn the ins and outs of marketing, creating awareness and boosting books sales. A wealth of practical, easy-to-use, won’t break the bank information! 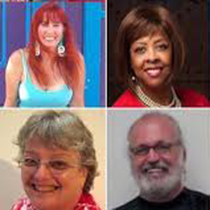 Presented by 4MP: Dona Lee; Pat McKanic; Al Musitano and Brenda Spalding. Only $25, includes workshop materials/handouts and continental breakfast. Click HERE for Eventbrite tickets.